Samples of soils and/or groundwater are taken during environmental characterization activities conducted on the surveyed property. Phase 2 is referred to as the preliminarily environmental characterization, whereas phase 3 is referred to as the complementary environmental characterization. If signs of contamination are detected on the property during phase 2 completion and the level of contamination is required to better plan for the decontamination work, a second environmental characterization can be carried out solely for the contaminated area. That is the phase 3 complementary environmental characterization. Phase 3 is therefore required in some cases to better determine the surface and depth of contamination, to better budget and plan for the decontamination work. All environmental characterizations are conducted in accordance with the provisions of the CSA Z769-01 standard of the Canadian Standards Council and in compliance with the specifications issued by the MDDELCC. Plan the sampling campaign from the contamination sources identified during Phase 1: Sampling Patron (ground and/or surface waters, soils and/or sediments), sampling method and number of surveys, projected number of laboratory test samples, cost and work timeframe. Harnessing the necessary human and material resources. Proceeding with requests for authorization (as necessary). Submitting samples to laboratory analysis. Interpreting laboratory analyses results according to prescribed criteria. Drafting the technical report and making recommendations. What are the contamination criteria for soils? The soil contamination level is based on the generic use criteria found in Schedule 2 of the MDDELCC’s Soil Protection and Rehabilitation of Contaminated Sites Policy (SPRCSP), namely levels A, B and C.
Based on the use of the property being assessed (e.g. residential, commercial, industrial), levels of contaminants on site will be tolerated to some degree. For example, the contamination level authorized for a commercial property is level C, whereas as it is level B for a residential property. Generic criteria are therefore used as decontamination objectives relative to site use as well as indicators of contaminated soil management. Level A: Background content for inorganic parameters and quantification limit for organic parameters. Level B: Maximum acceptable limit for residential, recreational and institutional areas (e.g. hospitals, schools and day care facilities). Also included are commercial parcels located in a residential area. Recreational use includes cases with different sensitivities. Sensitive uses, such as playgrounds, must be managed according to level B criteria. Level C: Maximum acceptable limit for commercial parcels not located in a residential area and for industrial parcels. Recreational uses such as cycle tracks are considered less sensitive and may be managed according to level C criteria. The SPRCSP provides that environmental responses (e.g. contamination due to a one-time event and insurance request) are expected to achieve the level of decontamination established in the SPRCSP following its coming into force and that the site is to be reclaimed to equivalent pre-disturbance conditions. In the case of unknown pre-disturbance conditions, the site must be decontaminated to achieve background levels provided in the generic use matrix. What are the contamination criteria for groundwaters? Groundwater contamination is defined in Appendix 2 of the MDDELCC’s Soil Protection and Contaminated Sites Rehabilitation Policy. Two use criteria are set: namely the “consumption” criterion, which is considered if groundwater wells are located on the premises of the study, and the “seepage into surface waters or infiltration into sewers” criterion used in other instances. How are soil and water samples drawn? Good knowledge of site geology and hydrogeology and the physical and chemical properties of contaminants is essential to obtain a good sampling pattern. Therefore, the investigation methods and sampling campaign are project-specific and require great expertise. Several techniques can be used to draw soil and water samples. 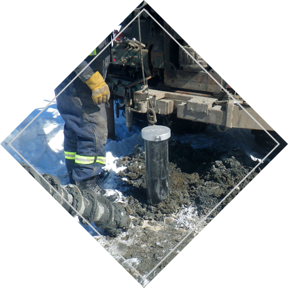 Depending on the site’s constraints and features, soil samples are usually drawn using test drilling or trenches. During drilling, soil cores are drawn using split spoons. Soil core sampling provides a good insight into contamination depth while limiting soil disturbances and activity disruptions on site. In some cases, it is important to opt for test trenches. Test trenches are dug using excavators and give a better idea of the extent of contamination in the first layers of soil (2-5 meter deep). To allow groundwater sampling, an observation well comprised of a PVC strainer is installed in a borehole. The observation well’s straining section must allow the sampling of groundwater from the suspected source of contamination regardless of fluctuations in the water table level. Observation wells are installed according to the handbook 3 (groundwater sampling) guidelines of the MDDELCC’s guidance manual for environmental analyses sampling. What samples are analyzed and where? During soil characterization, analysis of the stratigraphy (nature of soils) and environmental quality (e.g. organoleptic contamination indication) of soils surveyed are performed. Those samples most representative and likely to demonstrate contamination are analyzed in a laboratory. Soil and water samples are shipped to an independent and MDDELCC-certified laboratory. Several factors play a role in the number and type of analysis performed (e.g. type of contaminant, source and extent of contamination, etc.). Therefore, each project is unique and must be conducted by a team of experts. What are the possible outcomes of a Phase 2 ESA? When all soil and/or groundwater samples analyzed indicate compliance with the SPRCSP criteria, no additional investigation is recommended. The site is then considered free from environmental constraints in the surveyed areas. Where concentrations above the site criteria are identified, it may be recommended to conduct, in some instances, a complementary Phase 3 environmental characterization to determine the extent of contamination. This Phase 3 study makes it possible to better budget and plan decontamination work. Finally, where concentrations above the site criteria are identified, it may be recommended to proceed with decontamination work directly. How to ensure the validity of a sampling campaign results? A quality assurance and control program for soil and groundwater is carried out to ensure the reliability of laboratory analysis results. All sampling campaigns conducted by Environnement PH inc. include a quality control program that meets MDDELCC requirements. The number of duplicate samples drawn for the purposes of the control program is partly based on the heterogeneity of the land as well as the objectives and issues of each project. Handbook 1 of the guidance manual for environmental analyses sampling states that at least 10% of duplicate samples must be analyzed to ensure the scientific validy of assessed test results. However, a minimum of 1 duplicate per sample batch must be analyzed. Furthermore, a chemical analysis report with the stamp of the chemist responsible for laboratory analyses is provided at the end of the mandate. This analysis report also determines the validity of the sampling campaign results. It should be noted that analyses are conducted by an independent, MDDELCC-certified laboratory. The CSA Z769-00 standard sets out the principles that guide the conduct of a Phase 2 Environmental Site Assessment (or Phase 2 Environmental Site Characterization). It guides the conduct of a Phase 2 and provides the minimum working methods to meet regulatory requirements. This standard is a follow-up to CSA Z768-01 used during Phase 1 Environmental Site Assessments. All Phase 2 Environmental Characterizations conducted at Environnement PH inc. are Z769-00 compliant.